Clematis is an extremely useful genus of both woody and herbaceous perennials featuring around 250 species and many varieties. They have been called “the aristocrat of climbers” due to their bountiful blooms, which come in a wide array of sizes and colors, including bi-color varieties. If you are looking for a climbing, blooming plant to add height, color and structure to your garden, you’ll want to start growing Clematis. Clematis is sometimes delegated to the “Moderately Tricky” bin within the gardening world, which I find ridiculous. Are you a gardener? I thought so. 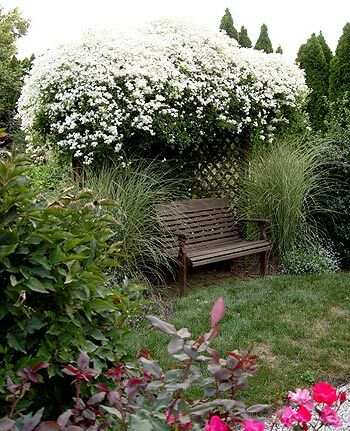 You can grow Clematis without any problem. Nursery cultivation of Clematis began in Europe in the mid-1800s, with plants collected from Japan and China serving as the parents of all Clematis sold today, meaning there are plenty of relatively disease-free varieties hardy to as cold as USDA Zone 4, with plenty that thrive in USDA Zone 9 or better (though in areas of the US with blistering heat and lengthy summers, not so much). Plants in this group bloom early spring, from buds formed the previous growing season. For this reason, if pruning is called for, prune plants soon after blooming and no later than mid-July. Species in this group include C. alpina, C. macropetala, C. armandii, C. Montana, C. Chrysocoma. Plants in this group are among the most popular with gardeners. Bloom time is around mid-June. Prune in winter, February to March, removing weak and dead stems, then cutting the plant back to the topmost set of plump, green flower buds. If not certain, wait until spring, when these buds swell, and remove growth above the buds. Popular varieties such as ‘Nelly Moser’ and ‘Duchess of Edinburgh’ are Group B Clematis. Clematis plants are not difficult to grow if you are a gardener interested in doing a little gardening. Key to successful growing is soil. For each plant, you will want to prepare proper soil in an area two feet deep with a circumference of at least two feet. 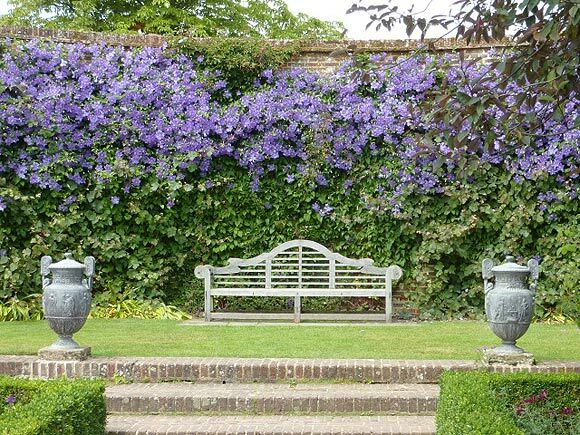 Unless you are blessed with decent gardening soil to begin with, it is always worthwhile to remove completely the soil where you will be planting a clematis, and replace it with soil high in organic content, plus enough mineral soil or sand content to allow for adequate drainage. At the very least, dig out what you have, discard one third, and mix in one third compost and/or rotted manure, and plant using that. Clematis prefer soil with neutral to slightly alkaline pH, a range of 7.0 to 7.3. They will adapt to slightly acidic soils, but in soils with pH below 6.7 or so, you will want to incorporate some lime in order to raise the pH. Your first step probably is to get a soil test, including a test of the garden soil blend you purchased, if completely removing existing soil, or a test of the concoction you created using two-thirds of your native soil. Very important: After removing the plant (and often, a stake of some kind) from the pot, plant the top of the root ball two inches below the surface of the finished planting hole. Clematis do not like hot or even warm feet, so it is important to mulch around the base of each plant with a two- to three-inch layer of organic mulch. 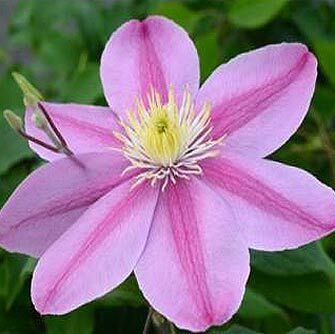 You may also want to plant other perennials or low shrubs nearby that will grow out to shade the base of the Clematis plant. Clematis require some type of structure on which to grow; it is a vine. Keep the stake in place that came with the plant, then after you get some new growth, train the plant onto the trellis or fence by holding the individual stems in place with those green paper or plastic twist ties, then remove the stake. Water well at time of planting, ensuring that the entire planting area is saturated, then maintain by watering every five days the first month, at least one gallon per plant, then weekly watering after that for the first season. Once established, weekly watering is necessary, particularly in extreme heat of summer. The most common disease problems are fungal stem rot (Clematis wilt) and powdery mildew, which can occur about as often as on any other plant type on you property. Good airflow around plants is the best preventative, along with good soil to begin with, and spring fertilization with an all-purpose organic granular fertilizer. Most Clematis varieties require full sun (six or more hours of direct sunlight daily) though some prefer part sun. Sometimes a plant that didn’t enjoy southern exposure thrives in an eastern exposure. Many varieties like a little respite from intense midday sun. Best to ask at the nursery and consult the Internet to get the best location/sun exposure information for the variety you are interested in growing. So where to plant? Anywhere the sunlight exposure matches the variety you wish to grow, and you’d like to create a flowering wall or fountain. Trellises along fences, the side of a gazebo, corner posts of an outdoor patio trellis, at the base of arbors, even alongside an evergreen tree that you wish to accent with a colorful scarf—the sky is the limit.